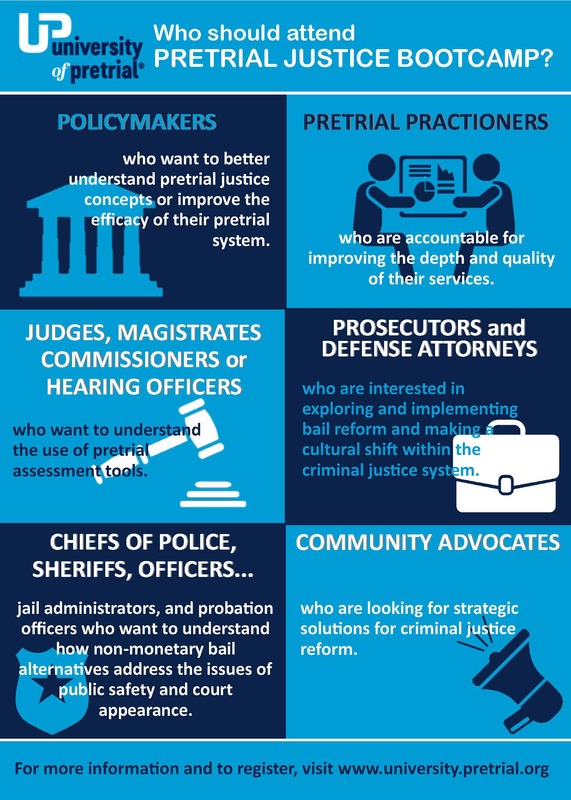 Pretrial Justice Bootcamp is an intensive 2.5 day training that provides an overview of the pretrial system, its legal foundations, and the latest research. Join expert faculty and colleagues from across the country in Las Vegas for this interactive classroom experience. If you're new to pretrial or looking to make improvements in your system, this course will offer the information and tools that you need. Please contact Meghan Guevara (meghan@pretrial.org) with any questions. Note: Because we have participants from different states and different disciplines, we do not certify our courses in advance for CLE or CJE. However, if a participant would like to submit the course themselves for credit, we are happy to provide whatever supporting documentation they need, including the syllabus, faculty credentials, instruction hours, etc.